"...most people don't realize that inside every Kappa Roll is wrapped the friendship of two special friends who chose to save each other." The story takes us from the peaceful countryside of old Japan — "a green land with clean, clear streams"— to the changes that were wrought as the country modernized. The wonderfully detailed illustrations illustrate this changing landscape. The eternal verities remain. 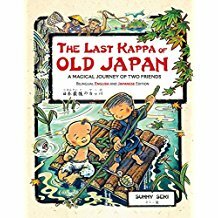 A chance meeting between Norihei the human, and Kyu the kappa, blossoms into friendship. When Kyu is threatened with capture Norihei warns him. Kyu manages to escape. But change is setting in. Kyu tells Norihei that his family is moving, because the place is "getting dangerous." He leaves his friend with a crystal necklace as a means of contact. The friends don't meet for a very long time. Do they forget each other? Read the book to find out. Interwoven in this wonderful tale of friendship and loyalty (no matter the species) is a subtle environmental message. The kappas are endangered as the water becomes polluted. The sub-text is that pollution affects all creatures of the earth. Cheery illustrations, a simply told tale, and a quietly stated message. This is a book that belongs in every school and library.